Watching the fast-paced, two-person manzai routines that characterize much of Japanese TV comedy these days, it’s difficult to imagine that two key influences on that genre’s birth were stars of cinema’s silent era: Harold Lloyd and Charlie Chaplin. It’s also difficult to imagine that Yoshimoto Kogyo, the entertainment company that is almost synonymous with manzai, would trumpet the foreign origins of its staple. 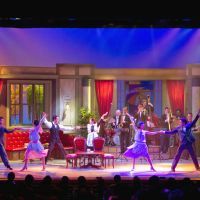 And yet, in the second in a series of plays now being staged at its recently refurbished Namba Grand Kagetsu theater in Osaka to celebrate the company’s 100th anniversary, that’s exactly what they do. 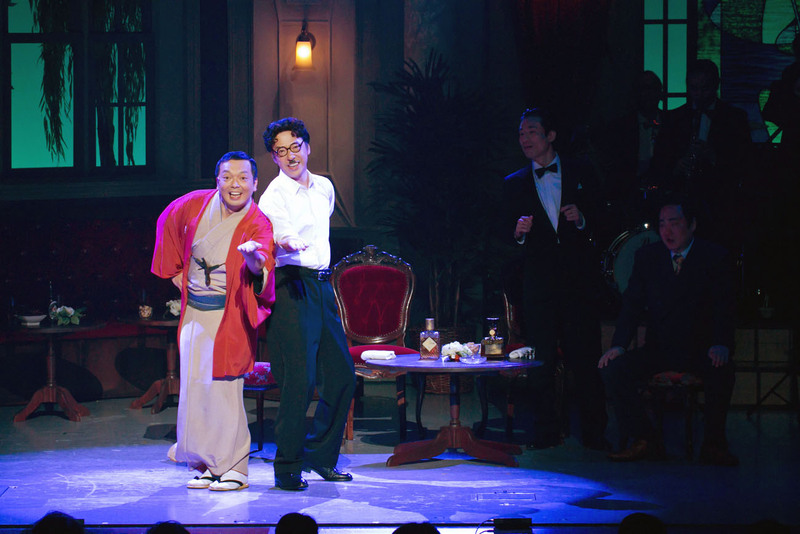 “Kimi to Boku kara Hajimatta” (“It Started from You and Me”), is a brand new play that tells the story of Entatsu Yokoyama and his comic sidekick Achako Hanabishi, two performers who in the 1930s became Yoshimoto Kogyo’s first full-fledged superstars — and who are now considered the “fathers” of modern manzai. The play, penned by TV scriptwriter Chikako Osagawa, kicks off one evening in 1929, as the general manager of Yoshimoto Kogyo, Shonosuke Hayashi, entertains comedians from his stable at an Osaka jazz bar. (Hayashi assumed control of the company that his sister, Sei, and her husband, Yoshibe Yoshimoto, started in 1912 — events that were depicted in the first of the series of plays, which was staged in April.) The guests include Achako (played by comedian Reiji Nakagawa) and other successful practitioners of the “old” form of manzai, which combined singing, dancing and storytelling and was performed in traditional Japanese clothing. While Osagawa’s play makes no claim to historical accuracy, it keeps fairly close to the facts. Concerned that his company’s two key styles of performance — rakugo (one-person comic storytelling) and manzai in its then-current form — appear old and boring in the eyes of the young generation, Hayashi is on the lookout for something new. He eventually finds his answer in the pages of a newspaper report: Entatsu (Itsuji Itao), a former comic theater actor who had long fallen off the public radar, has just returned from a tour in the United States. 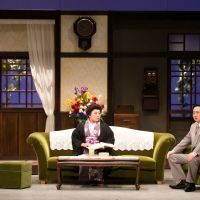 The narrative arc of the play guides us through Hayashi’s meeting with Entatsu (both he and Achako are generally known by their first names) and the two of them hatching a plan to create a new form of manzai stripped of the singing and dancing and focusing just on conversations between the two performers, who will adopt exaggerated, Western-style hand gestures and also wear Western clothes to better reflect the tastes of the young. The cleverest scene is where Hayashi introduces Entatsu to Achako, and then delicately pushes the two into a conversation about jazz, which slowly but surely takes on the form of an impromptu manzai routine. “What’s the latest dance craze in America?” enquires Achako. “That would be the quickstep,” answers Entatsu. “No, qui-ck ste-p,” says Entatsu. 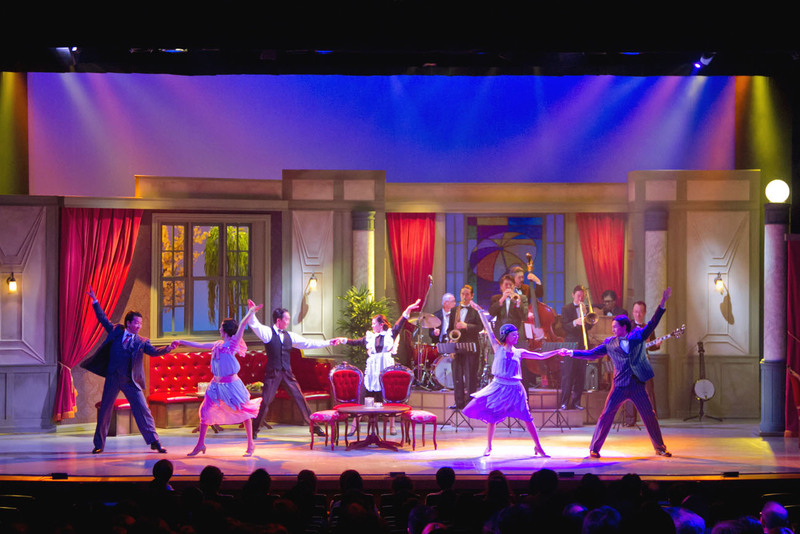 The assorted characters on stage laugh as they realize the comic potential — and so does the audience. Achako then goes on to make several jokes about the quick-witted Entatsu’s “modern” appearance, and in particular two physical traits that all but define his look: a Chaplin-style mustache and round, steel-rimmed glasses like those worn by Harold Lloyd. The assumption, which was repeated by the play’s star Itao at a recent press conference, is that Entatsu had brought back the new look from America, where he had been touring. “Well if you look at the mustache and the cane, I think you can tell he was influenced by people like Chaplin. I guess he saw them while he was in the States. And also the body movements, too,” Itao said. In fact, Entatsu’s interest in Western comedy dated from long before his six-month visit to Hawaii and the mainland United States between September 1929 and March 1930. In a 1965 essay, the late novelist Koen Hasegawa explained that Entatsu had been addicted to the films of Chaplin and Lloyd since the early 1920s, and that he adopted the mustache and glasses — what Hasegawa describes as his “Chaplin-plus-Lloyd look” — for his stage work back then. After three months of successful shows in Hawaii, another benefactor paid for Entatsu to go to the U.S. mainland, where he recalls performing to crowds in Chicago and elsewhere. “Before the money ran out I bought a ticket on a proper cruise liner for the trip home,” he writes. Perhaps that meant the shows were a flop, but perhaps he had simply gone as far as was possible in America’s Japanese-language market. What does seem likely is that prior to his visit to America, Entatsu had only come into contact with Western comedy through silent films, which remained the cinematic norm through 1929, when Entatsu went there. In a 2007 book, comedian and film director Takeshi Kitano went so far as to claim outright that Entatsu and Achako’s most famous manzai routine, “So-gei Sen” (the “Waseda-Keio Match”), was a “copy” of the famous “Who’s on first” routine by two of the burlesque circuit’s most famous graduates, Bud Abbott and Lou Costello. Kitano presumed Entatsu had seen the pair while he was in America. That seems unlikely — “So-gei Sen” was first performed in 1934, and Abbot and Costello didn’t start working together until 1936 — but it is possible that Entatsu saw and was influenced by similar two-person routines, which were already popular at the time of his stay in America. 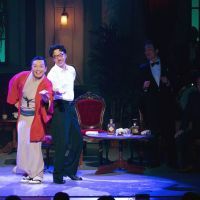 In the current play, Entatsu insists that in new manzai he and Achako should talk about “normal things using normal language,” and that the back and forth between the two of them should have a “rhythm like jazz.” That could well be how two-person burlesque routines sounded to a touring Japanese man with little understanding of English. In his autobiographical essay, Entatsu discusses his approach to manzai-writing in more detail. “We deliberately chose to talk about things that the audience would be familiar with. Like, if we were going to do something about the zoo, we would go to the zoo. So, we could say things like, ‘You know how the elephants are next to the tigers …’ What we were talking about was real, so regardless of whether the audience liked it or not, they couldn’t help but follow along. We were trying to achieve a kind of ‘real’ humor — not something that was a fiction,” he explains. 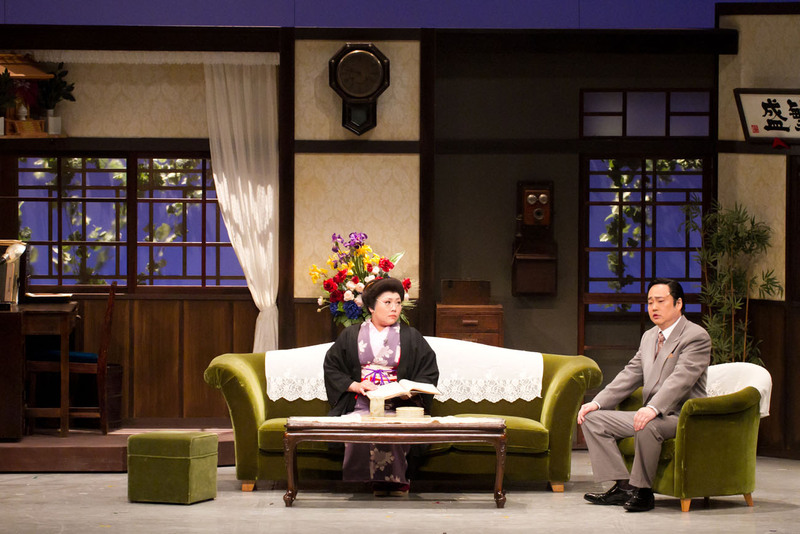 The play concludes with Entatsu and Achako on the brink of national stardom. Achako, in his new suit, and Entatsu, with his suit, glasses and mustache, have just perfected “So-gei Sen,” and appear on stage, standing abreast of a mike in the style that subsequent generations of manzai fans would recognize. “Oh absolutely. The name says it all. You can’t go passed the So-gei Sen,” Achako responds. “Yes. But, can you remind me who the opponent is again?” Entatsu asks, not realizing that So-gei actually means “Waseda-Keio,” thus indicating it’s a match between those two universities. It’s as though he’s half-intending to familiarize his audience with his new approach to comedy. And, of course, they got it. Halfway through the routine, there is a subtle cut to a live recording of the real Entatsu and Achako doing that same routine. It’s a poignant touch. After all, it was a live radio broadcast of “So-gei Sen” in 1934 that made the duo household names — and thus established their Western-informed approach to stand-up comedy as a model that continues to be imitated to this day. “Kimi to Boku kara Hajimatta” (“It Started from You and Me”) continues through June 6 at Namba Grand Kagetsu theater in Osaka. Tickets cost ¥6,000-¥7,500. For more information, visit www.yoshimoto.co.jp/100th/monogatari.